"Mom thank you for always believing in me and helping me through life's challenges! I love you so much!!" 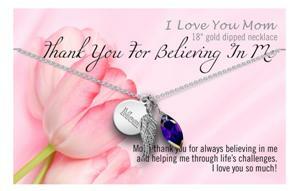 18" necklace with while gold dipped mom and feather charm with amethyst charm.